Deciding on a college is a huge decision. Your first real job is going to be decided entirely by the education section of your resume, which you’ll have to fluff up with accomplishments, awards and courses taken until you get some real experience. That’s why you don’t want to pick a school with a student body that prides itself on attending more football games than classes. Then again, you’re only young and supported financially by your parents while living on campus once right? Whether or not you’re looking to avoid or attend the biggest party schools, you need to check out America’s Douchiest Colleges. 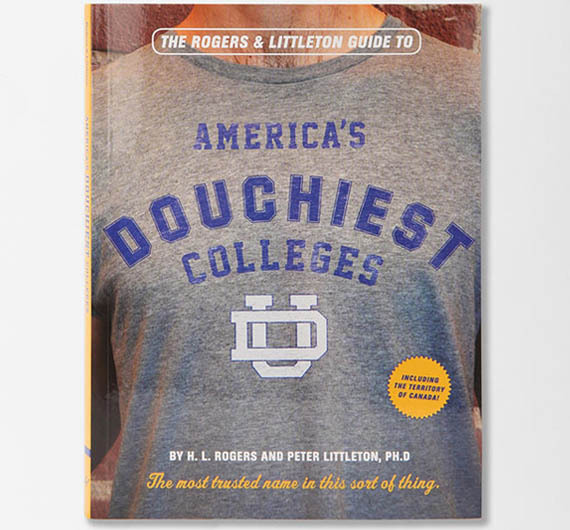 Written By H. L. Rogers & Peter Littleton, Ph.D., the book shows you all of the stuff that you’ll never see in a college pamphlet, like douchey fashion, extra-curricular activities (like drinking and lighting stuff on fire), popular pick-up techniques and more.